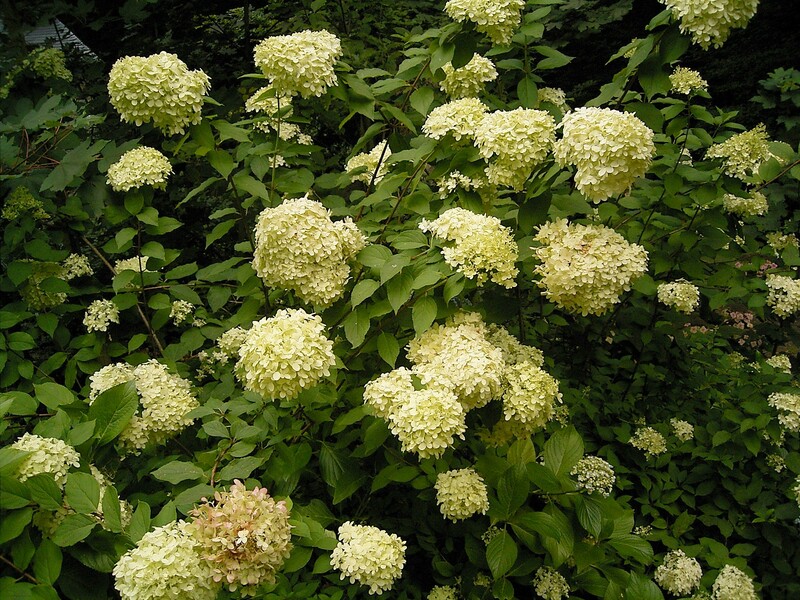 Hydrangea paniculata is a shrub to 5 m tall, usually less; stems straggling, bark reddish-brown, older bark gray, peeling, branches arching. Leaves opposite, 8-15 cm long, 3-7 cm wide (Dirr 1977), elliptic, base wedge-shaped, tip pointed, margin toothed. Flowers white, greenish or bluish in age; of two kinds, fertile flowers numerous, very small, sterile flowers, large, 4-parted about 4 cm wide, at ends of inflorescence branches; inflorescence dense, pyramid-shaped, branched, 15-25cm long, blooms Aug-Sept., dry flowers may persist through winter. Wetland status: FAC* (little data). Frequency in New York City: Very uncommon escapee. Habitat: Found in moist-wet woodland in partial shade.